Among the competitive swimming strokes, the backstroke is probably one of the more unique, in the form of your body position. 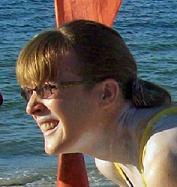 It is also known as the back crawl, as opposed to the front crawl swim stroke, better known as freestyle. Your upper body and the back muscles are important to propulsion and speed. The best way to think of the backstroke is as a backwards or upside down version of the freestyle stroke, since there are many similarities to these two long axis swim strokes. Among competitive swim strokes, the back crawl bears some speed resemblance to the butterfly and competitive swimmers will have similar results, with these two swim strokes. Because you are mainly on your back, while experiencing core rotation from side to side, you use different muscles and use them differently than you do in other competitive strokes. Strong back or spinal muscles can help you increase speed. The primary difference with the backstroke is your latissimus dorsi are the more prominent muscles used, when comparing it to the butterfly or freestyle strokes. Your hands and arms, along with kicking of the legs, are part of the catch, finish and recovery phases. Perfectly synchronizing your movements will help you excel at this more difficult swim stroke. Strong biceps, wrist flexors and elbow transitions from 45 to 90 degree angles of flexion, are supplemented by kicking of the legs, which bear some similarity to freestyle and butterfly kicks. The starting or “home” position of the back crawl starts with a flat back position and alternates into a side-lying position, with each stroke beginning and ending in this position. As the core rotation of the body takes place, the energy (chi)is transmitted to the arms and legs, which should work in perfect synchrony, for speed and effectiveness. To start, arms are stretched, fingertips are extended and the legs are extended backwards. The arms are responsible for the most forward movement, so strong biceps increase the power phase of the stroke. One arm sinks underwater, with the palm turned outwards and as the hand enters the water with the pinkie finger leading, the semi-circular movement catches the water. The palm should always face away as the elbow pushes at a maximum angle of 90 degrees. More leverage and power is given to the complete cycle of the stroke, as you “push off” against water resistance. During recovery, you remain on your side, with the underwater arm fully-extended, until the recovering arm gets past your head and the palm is rotated to point towards the legs, with the thumb side pointed upwards. The reciprocal strokes and the sideways body profile lowers water resistance and propels you through the water quicker than if you were swimming flat on your back. It’s essential you practice, if you want to perfect this long axis swim stroke, but coordinating the movement of both arms with your kicks yields more speed and power. Core-driven propulsion is the goal of any swimming stroke, since you won’t gain speed and may become exhausted, when only using your arms and legs. The backstroke involves all of the major muscle groups, but the core muscle groups link the upper and lower body. Your pectoralis major is involved, just like with the freestyle, but only to a lesser degree. The shoulder stabilizers play an essential role in an effective backstroke, as they do in the other competitive swimming strokes. The kicking motion is reciprocal, but the difference is the most force is generated during the upbeat portion of the kick, instead of the downbeat portion of the freestyle kick. Strong abdominal, hamstring and quadriceps muscles add brute strength to the backstroke, like they do in other long axis swim stroke techniques, such as the freestyle or front crawl swim stroke. 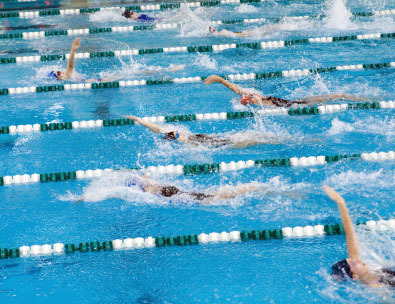 The “dolphin kick” is used to start competitive swimming races and it is also used to propel off the turn wall. You should practice using your core muscle group, because they play a large part in the most effective backstroke. If you are a natural swimmer, you may find the synchronization easier, once you have mastered the foundational techniques of this long axis swim stroke. Warm-up: Long fins on, 500 freestyle alternating 25 kick on side and 25 two-beat kick. 500 with fins still on as: 25 backstroke, 100 freestyle 2-beat kick, continuous.